Meiji-mura Illusion | Digitalestate Inc. Please enjoy “Meiji-mura Illusion” in preview. The radio drama script “Meiji-mura Illusion” is a byproduct of the author at Konjo Gakuin University which was enrolled at the time around 1995 (Heisei 7), when creating a Web page for promotion of the museum Meiji-mura. Originally it started with writing a script for the movie with the theme of Meiji-mura, but from that time it was difficult to realize that both movies and videos had too many hurdles to produce. That is why it had been asleep for 15 years. With the achievement of students live broadcasting on community radio for more than two years, in May 2010 we introduced a special radio booth set with sound editing software and PC for Radio broadcasting, we planned to produce it as radio drama. After 15 years, the script finally got the voice and produced as a sound material. That is the birth of a radio drama Meiji-mura Illusion. Meiji-mura illusion, as the title, the story progresses in a mysterious space where the parallel world of the modern and the Meiji era (1868-1912) coexists with the setting in the museum Meiji-mura. Meiji-mura is usually only a museum of buildings that visitors enjoy by touching the representative buildings of the Meiji era. By the way, it says that the soul of a human living there lives in a building. If so, it is no wonder that Ogai and Soseki’s souls are drifting somewhere in Mori Ogai and Natsume Soseki residence in Meiji-mura. Lafcadio Hearn (Koizumi Yakumo) may be settled there in a summer villa. Ayano, a student at a private girls’ school in Nagoya, was involved in some accident and disappeared inMeiji-mura.Narumi, a student who came to visit the Meiji-mura to write the report of the university, suddenly slipped into the parallel world of the Meiji-mura in the Meiji era of modern times, pulled by the cat who Is supposedly the main character of Soseki Natsume’s novel. She met there two people who organized the Meiji-Mura Museum. They continued to monitor so that historical figures who settled inMeiji-mura will not time-slip to the present day.They appeal to bring Ayano back to the former world as much as possible so that trouble will not occur between the inhabitants of Meiji-mura and modern people. They worry if Ayano does not fall into close relationships with young Ogai. With curiosity, Soseki undertakes a role to introduce Narumi to Ayano. 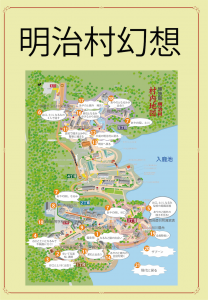 Do you know Meiji-Mura in Inuyama city, Aichi? Meiji-mura is a museum of building which the president of a railroad company has fulfilled the wish of architects who lamented the precious buildings of the Meiji era will be lost. Will Narumi and Ayano come back safely in the original world?